Since 2011 Hexagon Conference (news link), the news of new revamped GeoMedia product is being heard everywhere. It was then announced that the product would be out by end of 2012. And that day is fast approaching! As promised earlier, Intergraph is on the way to release its flagship product by the end of this year in December. After acquisition of ERDAS and Intergraph by Hexagon many good things have happened. Intergraph was always seen proudly proclaiming about the benefits of having two great products from the same vendor. Synergy series webinars hosted last year showcased what things are in store for customers using both the products. (Read how ERDAS Imagine and GeoMedia are live linked). This post takes you around GeoMedia 2013 and describes what great things are enroute. All new intuitive ribbon interface, in line of MS Office and ERDAS IMAGINE. Ability to minimize the tabs and add existing commands (single/group) to a custom tab would be possible. The best part is this can be saved as an XML file which can be moved between machines and shared with others to get the same 'My Workflow' ribbon tab. The client side data caching mechanism implemented is responsible for making data display faster. In the demo I was impressed to see millions of vector features rendered in a matter of seconds. Also this cache is said to stay up-to-date in line with edits performed. 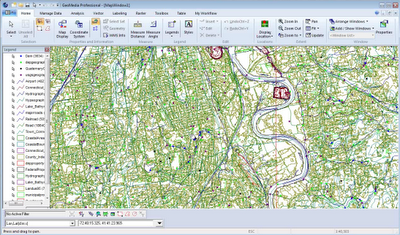 It works with all data servers supported by GeoMedia - Oracle, Access, SQL, shapefile etc. Ability to dock legend to any corner of the screen and autohide the legend. This can go a long way in saving screen real-estate. Dynamic label placement which updates as you move around in a map. Better label conflict management and editing of static labels would be possible. This looks to be the result of the OEM agreement signed by Intergraph with MapText, Inc., in June this year. The new release will ship with both Ribbon and Classic Interfaces (probably for the benefit of old customers). Except Microsoft every company which moved to Ribbon interface appears to have done this (Autodesk). GeoMedia will be available in three flavors - Essentials, Advantage and Professional. Same are the flavors of ERDAS IMAGINE. GeoMedia Essentials will include IMAGINE essentials. Ability to query and search for imagery which is made possible with ERDAS APOLLO Catalog Explorer integrated with GeoMedia. GeoMedia 6.1 (older release) and 2013 release cannot be run on the same machine. GeoMedia 2013 requires .NET 4.0. Different language packs will be available for download this time. A major effort towards localization also for right-to-left languages. No major changes in hardware requirements. Users may have to recompile their custom commands. API has not changed. Add-on products would not be released along with 2013 release. They will be delayed by a bit. 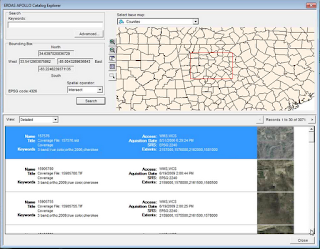 There will be release of GeoMedia Viewer 2013, that too with a ribbon interface! GeoMedia 2013 will support ECW 3.0. 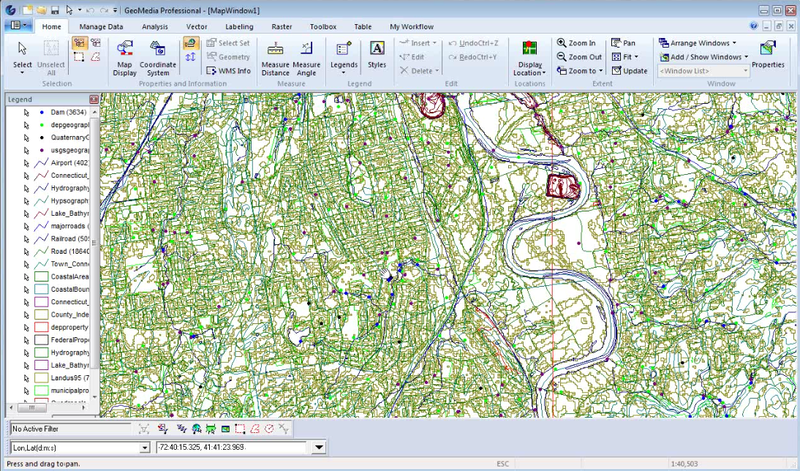 So it's time we follow Intergraph website and webinar updates to see what's in store for mapping professionals with 2013 releases.